National Security Adviser John Bolton will deliver a speech in Miami Thursday—just days away from high-stake elections across Florida—that is expected to lay out a tougher Trump administration stance toward Venezuela, Nicaragua, and Cuba. The speech will take place against the backdrop of Freedom Tower, a building where Cuban refugees were welcomed in the 1960s after fleeing the communist-run island nation. Miami is home to many immigrants from Cuba, Venezuela and other, Latin American countries who fled repressive regimes. "Tomorrow I will give remarks on President Trump's policy in Latin America at this historic Freedom Tower in Miami, Florida—I can think of no more fitting setting," Bolton tweeted Wednesday. A Cuban-run media website is already bracing for the address, which it characterized as an attempt to "reinforce the unjust White House policy against Venezuela, Nicaragua, and Cuba." The Trump administration has slapped increasingly harsh sanctions on Venezuela and Nicaragua over government corruption and human-rights violations. The sanctions against Managua came after the Ortega government's violent responses to protests across the country. The administration also pulled nearly all of its embassy staff out of Cuba over mysterious and still unresolved health attacks on U.S. personnel in Havana. With tight Florida contests for both governor and U.S. senator on the line, Bolton will deliver the remarks a day after Trump waded into the election battleground with an appearance in Lee County Wednesday. Trump will follow up with a rally in Pensacola on Saturday while former President Obama will try to energize voters with a Saturday appearance in Miami. Trump is trying to motivate conservative voters in Southwest Florida and the Panhandle to go to the polls and punch their ballot for GOP governor candidate Ron DeSantis and U.S. Senate candidate Rick Scott. Democrats are trying to energize Democratic voters in Miami for governor candidate Andrew Gillum and Sen. Bill Nelson (D., Fla.). Bolton will be introduced in Miami by Rep. Ileana Ros-Lehtinen, a Cuban-American and vocal critic of the Cuban government who is retiring from Congress this year. Despite her criticism of Trump on other issues, she has supported his administration's decision to roll back parts of Obama's 2014 diplomatic and economic thaw with Cuba. Last year, during a speech in Miami, Trump tightened rules on Americans traveling to the island and imposed some restrictions on U.S. companies doing business with the government- and military-owed companies that benefit from U.S. travel and tourism. Trump last month slammed Venezuela's "Cuban sponsors," linking them to the country's economic collapse. 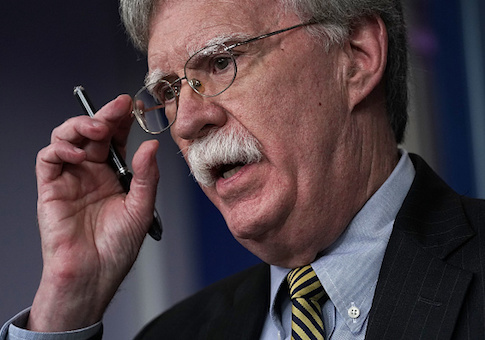 Bolton's speech is expected to build on that theme and signal new targeted U.S. pressure on Cuba's military and intelligence services, according to senior administration officials. Earlier this year, speculation swirled that the Trump administration would also impose targeted crude oil sanctions on Venezuela but the pressure in Washington to do so has fallen in recent weeks with a drop in oil production by the OPEC member. This entry was posted in National Security and tagged 2018 Election, Cuba, John Bolton. Bookmark the permalink.